More and more people are looking to the bus as a more affordable alternative to flying or even driving. New bus companies make for a crowded and competitive marketplace, but getting cheap tickets is still not guaranteed. Getting the cheapest seats on the bus requires a little bit of shopping savvy and a knowledge of how bus ticketing works. Greyhound is probably the most well known bus company in the US. Their service is far-reaching, and there are many methods for scoring discounted tickets. Special web fares are available on the Greyhound website. While these are often cheaper than tickets bought in-person, they are not guaranteed to be the lowest prices available. It is best to compare these web deals with other offers before purchasing. Last minute fares are often not the best way to go with Greyhound. Discounts are given for people who purchase in advance. Advance-purchase tickets are non-refundable, but can lead to discounts of 25% or more if purchases 21-days before departure. Discounts for 7-day and 14-day advanced purchase qualify for less generous discounts of 10%-25%. Regional specials are sometimes offered. Often, riders can increase their overall discount by purchasing these already discounted fares two or three weeks in advance. Greyhound Express is an express bus service run by Greyhound. They offer advanced-purchase fares for as little as one dollar, though the price is usually quite a bit more than that. Greyhounds BoltBus offers no-frills service on the East Coast, with the same type of dollar deals offered by Greyhound Express. Jefferson lines is a regional bus carrier that offers service in the Central US, including Midwest, Mountain West, Texas, and its neighbors. Like Greyhound, Jefferson gives discounts for people who purchase in advance, at least seven to fourteen days before their departure date. Megabus was one of he first low-cost bus companies to move beyond a single region. The company serves the Midwest and Eastern US. The company has earned a loyal following by offering things like free wireless internet and reclining chairs on its buses. Megabus lists promotions on their web site. They have even been known to have one dollar tickets and have even offered free rides. Sites like Retail Me Not list Megabus promotional codes. These can be used to get an additional discount on ticket purchases. However, the promotions change frequently, so getting a code that works for a specific trip is not as easy as it might seem. Megabus has a Twitter account and will tweet promo codes and announce sales. Following Megabus on Twitter is a good way to make sure the best deals don't pass you by. It can pay to be flexible with departure dates. Megabus will lower fares in order to make sure that their buses are completely filled up. This means that being able to wait for a departure date when lower prices are being offered can be the difference between paying $5 or $20 for the same journey on the exact same bus. The so-called Chinatown buses started the discount, no-frills bus revolution when they began offering cheap service between the Chinatowns in Boston, New York and other East Coast metropolises. Frugal travelers began using these buses to travel even if their final destination was not a Chinatown itself. With so many different services, it can be difficult to find the best price on a particular route. Booking sites are good resources for finding cheap tickets because users can search by route and then compare the offers from different bus providers. GotoBus.com lists routes nationwide, not just on the East Coast (where the original low-cost buses offered service). They are the best resource for West Coast bus travel. There are fewer resources for searching for bus fares than there are for airfares. 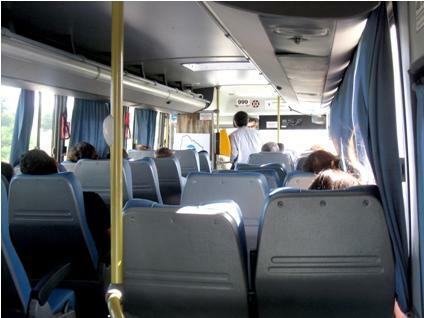 However, bus companies regularly offer promotions, discounts, and other chances to purchase cheaper tickets. For people who know how to navigate the system and find the best travel deals, bus travel is the cheapest way to get from Point A to Point B.